There are two things I cook more than anything else in my crockpot. Roasts, and soups or chili. Roasts are great because cooking the meat slowly can make the roast tender, moist, and full of flavor. Soups and chilis are perfect for the crockpot because all the flavors cook together, and the soup has time to thicken up. We love having a crockpot or slow cooker to get dinner on the table without a fuss! One pot to clean! Even if you use other tools and pots to prep your food for the crockpot, you can have everything cleaned up hours before you actually eat. This is great for busy parents, or when you are in carpool all afternoon. Having one pot to clean after dinner can be a real life saver. Flavor overload- As I mentioned with the crockpot chilis and meats, the flavor of your food has a chance to truly permeate the meal! Convenience- When there is a meal in the crockpot ready for dinner, you won’t be stopping for fast food. Dinner is waiting! Conserve energy- We love our crockpot, even in the summer because it takes less energy to cook food than the oven. Perfect meats– When meats are cooked in a slow cooker, the long cooking time tenderizes meat to perfection. 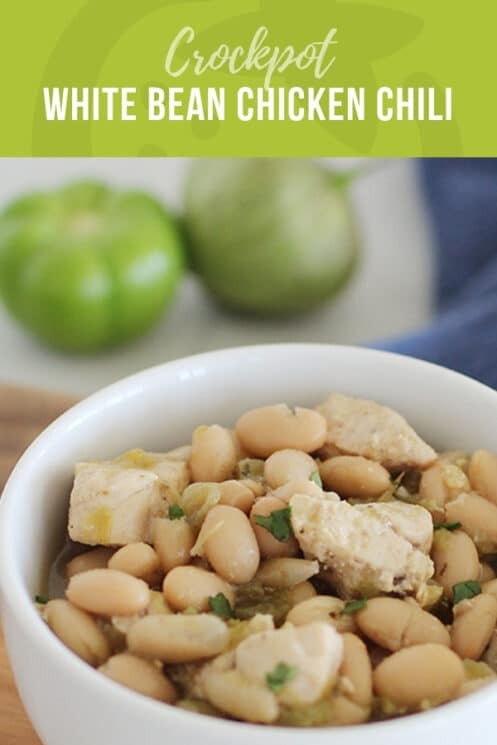 This recipe for White Bean Crockpot Chicken Chili has the best flavors! We used cilantro, diced green chilies, cumin, garlic, oregano, chili powder, and even a bay leaf! 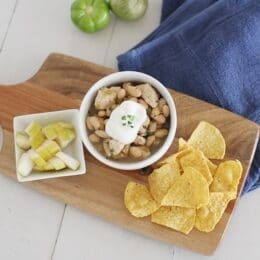 It looks like a lot of ingredients, but with so many of them being seasonings, it’s bound to be the most flavorful crockpot chicken chili you’ve ever made. Let us know if you try this chili and how your family liked it! Chop onion and tomatillos; mince garlic. Set aside separately. Heat oil in a large skillet over medium. Add onions and cook for 5 minutes, or until translucent. Stir in tomatillos, garlic, and cumin. Cook for 2 minutes, then transfer to a large crockpot. Drain and rinse beans; add to crockpot along with green chilies, broth, chicken, cilantro, oregano, chili powder, salt, and bay leaves. Place lid on crockpot and cook on high for 4 hours, or on low for 8 hours. Discard bay leaves. Remove chicken; shred with 2 forks and return to crockpot. 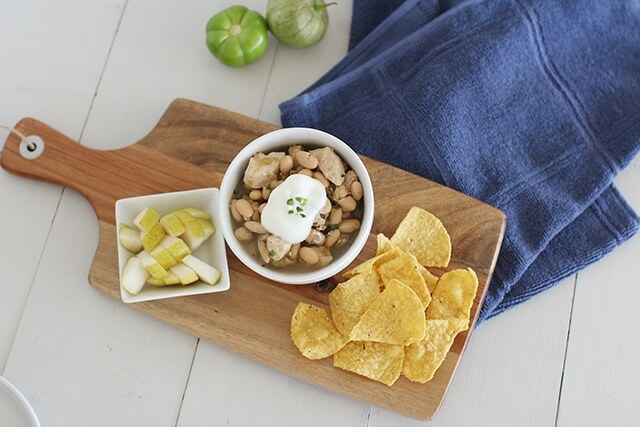 Serve chili topped with crumbled tortilla chips, sour cream, and chopped green onions. Not terrible but I’ve made better chicken chili that comes together in under 30 on the stovetop. Good for when you want to have dinner already prepared when you get home from work. This came together quickly and easily for the crockpot. 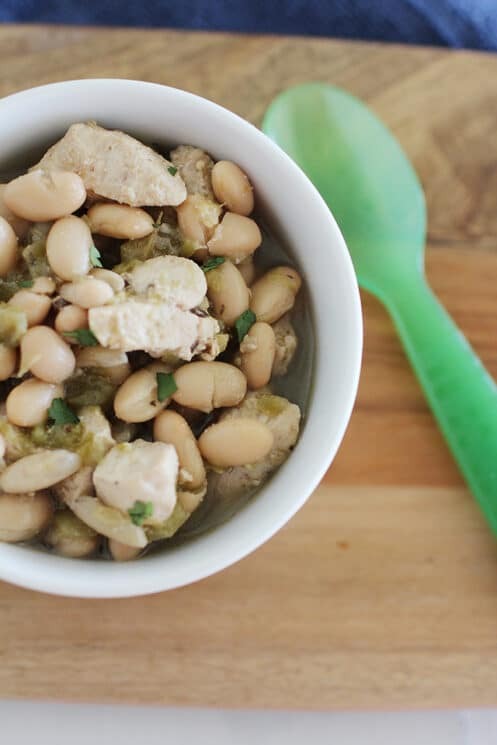 I added an extra batch of beans instead of chicken for our veggie update and I don’t use bay leaf in my cooking. We top with chips and salsa. This was excellent! We lost our tomatillos somewhere, but the flavor and texture were superb. I liked mine with sour cream, my husband liked it without. This is good enough to go on my list of recipes to bring over for neighbors and friends who need a few meals. 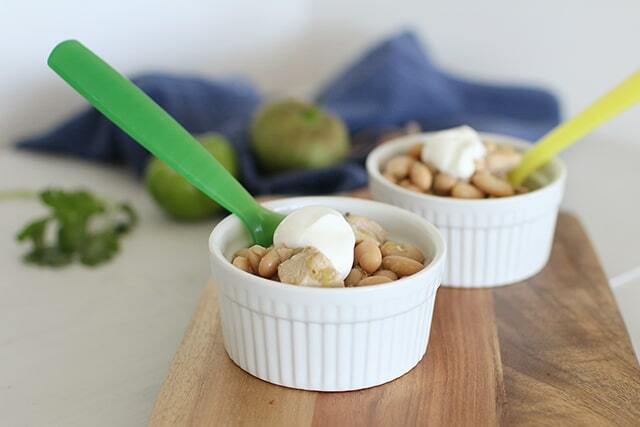 I never thought that healthy dishes could be so tasty! Thank you for your every recipe! Thank you for each delicious photo! I will recommend your site to all my friends!